Here’s to you, Rae Rosenthal! If you aren’t familiar with the name Dr. Rae Rosenthal, you’re completely missing out. 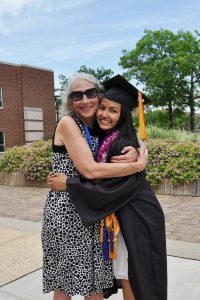 She is one of the most beautiful spirits on campus mostly known for being the Lead Director of the CCBC Honors Program. Dr. Rae started the program 30 years ago, operating from a single file cabinet. Today, the Honors Program has tremendously grown and remains to be one of the best things about CCBC – that’s not an opinion. Dr. Rae’s door is ALWAYS open for students and that’s one of the best things about her. I first walked into her office as a freshman in 2013 to meet with her and my fellow Fast Start Scholarship recipients, one of the scholarships the program awards. Since then, I’ve stepped into her office hundreds of times with so many different emotions. I’ve walked in there confused, needing help, celebrating, and crying. Every single time, I walk out a little smarter, more confident, more put-together, and overall better. Dr. Rae, if you’re reading this, I hope you know how much I appreciate you. If it weren’t for your constant support and genuine love the last 4 years, I wouldn’t be where I am today. I hope I’ve given you something to brag about. May 18, 2018 THANK YOU, CCBC! April 20, 2018 Here’s to you, Rae Rosenthal! What am I doing back at CCBC? Long story short, a Certified Public Accountant license requires more credits than a normal college graduate has. When I learned this, I thought of no smarter move than coming back to what became a home.